When you embark on the journey of family history, you never know what you might find. It's one of the joys of researching in the first place. If it was easy, all the pieces to the puzzle were assembled already, or everything went as you'd expect, it wouldn't be nearly as much fun. One ancestor who has taken me through all kinds of twists and turns is Mary 'Dolly' Moore. 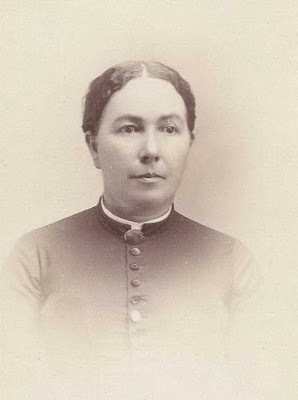 Technically she's my 4th great-grandmother, so it's pretty far back, but ever since I first learned she was born in Canada in 1820, I wondered about her roots. Those were the early days in Ontario, and many of the families there at that time had Colonial U.S. roots. I was curious where her roots might lead. She married at just 16 years old. In fact, she was baptized and married on the same day, Nov. 15, 1836, as she grew up Protestant and was marrying a Catholic, Arthur Hart. The baptism record for Mary Moore at St. Mary's RC Cathedral in Kingston, dated Nov. 15, 1836, noted she was "born of Protestant parents." It took me several years to find her parents. After many hours of fruitless research efforts, I'll never forget the day my cousin in Toronto, Killeen Farrell, wrote the words, "Sure looks like her parents," in an email. She was referring to a William and Susannah Moore living with Arthur and Dolly on one of the Canadian censuses. Indeed, Dolly had even named one of her sons William and one of her daughters Susannah. I pursued those names for a while before I found a notice for their marriage in the Kingston Chronicle in Oct. 1819, William Moore and Susannah Friel. Once I had Susannah's maiden name, the real fun began. I linked her to Loyalist families, the Friels and Lakes. The Loyalist families are well documented, and I soon found her parents' names, a War of 1812 vet Peter Friel and Mary Lake. Mary's family quickly went back a generation further, Christopher and Susannah Lake who came to the Kingston area from eastern New York State. For a while, I had what appeared to be all the right documents linking these families together. But in 2015/2016, I had the proof. DNA technology had advanced well enough, and I had enough relatives test, and we were matching the Friels and Lakes just as we should. It was a match. Well, today, on May 27, 2018, the journey took a new twist. Just when I thought I had the family decently documented, today I learned of a new sibling for Mary Moore - a sister - Julie Ann Moore. Many genealogies already on the Internet and primary source documents available online have a Thomas Wiley and Julie Ann living in Storrington Township, Frontenac County, Ontario - where my Mary (Moore) Hart also lived, along with her parents. But no maiden name for Julie Ann. Enter AncestryDNA. My Uncle Jim had been matching descendants of a Margaret Wiley born 1848 in Frontenac County, Ontario, Canada for a long time. Of course, I suspected there must be a link on this side of the family because the Harts & Moores were in Kingston at the same time. But over time, and especially recently, the Shared Matches piled up. The Shared Matches began crystallizing which branch of the family this link was on. It was absolutely a link through the Moore/Hart families, no question. Ironically, Arthur Hart - Mary Moore's husband - had a sister Elizabeth Hart who married a William Wiley. Easy to suspect that's the connection and that's it. But recently, the Shared Matches on Ancestry were pointing to Mary Moore instead for the link. But how? Back to primary documents with that new hint in mind. I quickly found Julie Ann and Thomas Wiley living in Storrington Twp, and learned that they did indeed have a Margaret Wiley in 1848. A match. But still, family trees on Ancestry were not listing a maiden name for Julie Ann. Then, I saw that Julie Ann and Thomas had a son named William and a daughter named Susannah. Coincidence? If Julie Ann was a Moore, all the pieces would fit together. And born in 1825, per the Canadian census, she would fit right in between the other known children of William Moore and Susannah Friel - Mary in 1820, Ann in 1823, John in 1828, and Daniel in 1831. There is a gap there. So at that point, I had plenty of DNA evidence, geographic evidence, and this Julie Ann had a William and Susannah on top of that. Then came the clincher. I found a marriage record for Thomas Wiley, a son of Thomas and Julie Ann, on FamilySearch.org. And his mother's maiden name: Julie Ann Moore. It was a match. Julie Ann Moore had at least five children with Thomas Wiley - William, Margaret, Nancy, Thomas and Susannah. And the family tree is really growing - William had 12 children of his own, Margaret had two, Nancy had eight, Thomas had seven, and Susannah had 11. Margaret (Wiley) Franklin, daughter of Julie Ann (Moore) Wiley. Photo from Cathy Del Vecchio. Since the 1841 Canadian census did not survive for the Kingston area, and church or civil records were not well kept for that time period, I can't think of any other way I could have confirmed Julie Ann Moore as a sister to my Mary without this DNA evidence. What does it all mean? It's more than an exciting addition for a new branch to the family tree. This represents more autosomal DNA links to pursue, as I look for any descendants of Julie Ann (Moore) Wiley to learn about the identity of Julie Ann and Mary's father William Moore. That remains one of my primary goals with that family, because while I have found plenty on the Friels and Lakes, I still don't know William's parents. One thing I do know - and where the DNA evidence is leading - William's family likely goes back from Canada to North Carolina or Virginia. And while that may seem a strange or unlikely path, it wasn't back then - Loyalists from those colonies helped to populate Canada after the Revolutionary War. My family is coming up with DNA links to the Moore family of New Kent Co, VA; as well as the Elmore and Melton families of New Kent Co, VA. These families migrated into North Carolina and spread out into Tennessee, Georgia and other southern states. The DNA evidence is mounting, and it's only a matter of time until I put his family tree together. Among the Shared Matches for one descendant of Julie Ann (Moore) Wiley and my family on AncestryDNA? Descendants of the Craddock family of Alabama, and they trace back to the Elmore family of New Kent Co, VA. So now things are really getting interesting. 4 comments on "A Moore Sister Found, Thanks to DNA"
Very interesting post. Isn't genealogy and now the abundance of atDNA matches wonderful. I am working on something similar. Well done. Thanks, Jo. It’s incredible what can be done with DNA, especially when combined with traditional records that are available. Powerful discoveries that may have never been made otherwise. Craig, Thanks, this is great. I love genealogy,, but you take it to a greater level. Glad you enjoyed it, Brian. Hope all is well.